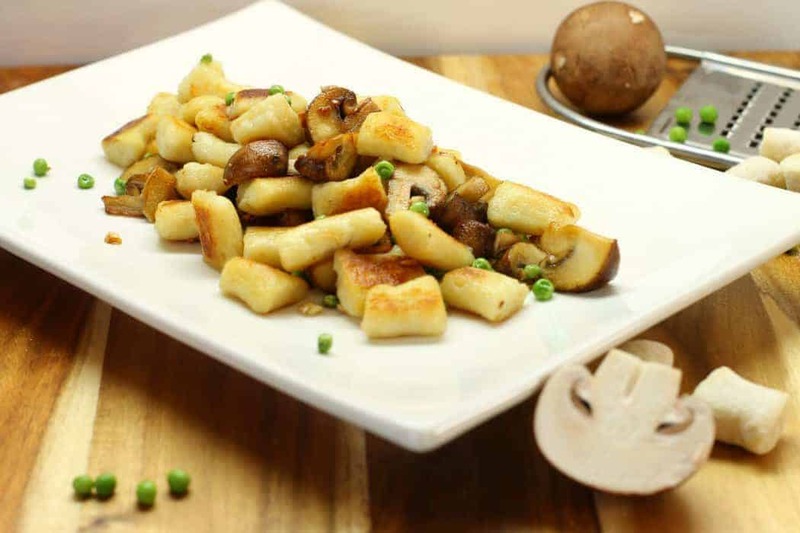 If you’ve been following along with my weekly recipe posts you may have noticed I occasionally share traditional German recipes such as these Spaetzle Noodles or this Zwiebel Kuchen. 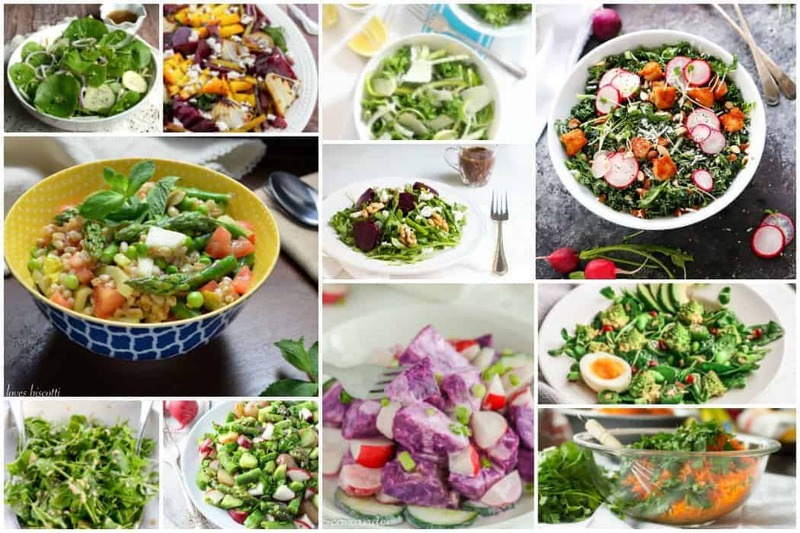 This week and just in time for Easter, I have another super delicious German recipe for you. 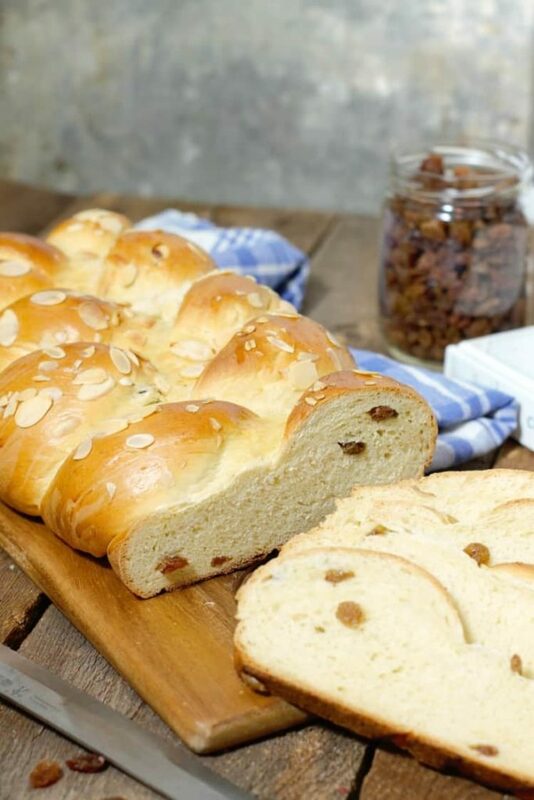 Rosinenbrot or Raisin Bread is a traditional style of bread baked for and served on Easter Sunday. Raisins at one point used to be quite expensive and a treat to be enjoyed on special occasions. 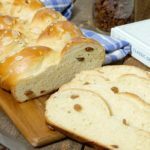 That makes their inclusion in this Easter bread the perfect treat after lent when families would fast or give up sweets. The recipe I am sharing today is not actually my own and has been adapted from the book Classic German Baking by Luisa Weiss from The Wednesday Chef. The instructions and pictures below are my own. I hope you enjoy this loaf of bread as much as I do, and don’t forget to check out Luisa’s book for more German Baking Recipes! Start by warming your milk in a pot on the stove, and activate the active dry yeast by dissolving it in the warm milk. Let it sit for about 5 minutes. Make sure the milk is not HOT as it will kill the yeast. Add the butter and egg to the liquid mixture and then using a wooden spoon start stirring in the flour from the sides until you have created one tacky ball of dough. Sprinkle a little flour on the counter, and knead the ball of dough for at least 15 minutes until it is super smooth, very soft and supple. Form a round ball and place it back in the mixing bowl. Cover with a clean dishcloth and let it rise in a warm area of your kitchen, (such as on top of the pre-heated stove) for 1 hour or until double in size. Once the dough has risen, loosen it from the bowl and return it to the counter top. You shouldn’t need much more flour to keep it from sticking to the surface. Flatten the dough and sprinkle the raisins on top. Fold the dough over on itself twice, and then start kneading it until the raisins are completely incorporated. If a few “fall” out its ok, either stick them back in or just set them aside. Cut the dough into 3 equal pieces and roll each piece into rolls 16 inches long and about an inch in diameter. 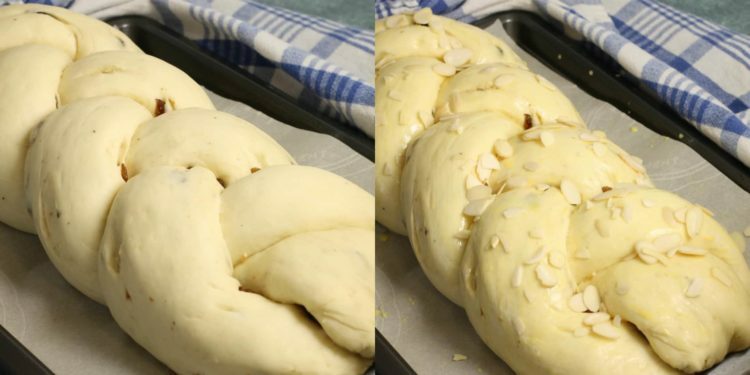 Braid the three strands of dough into one big braid. If you have never braided anything before it is very simple! Start by collecting the ends of all three strands at one end and pressing them together to connect them. Have the loose ends pointing towards you with each roll laying side by side. Then simply start by moving the outside roll over the middle one, and so on and so forth until you have braided the whole loaf. Tuck the ends of the loaf under to hide any loose sections. Transfer the braided loaf to the parchment lined sheet pan and again cover with the dish cloth. Let the loaf rise for another 20 minutes. At this point pre-heat your oven to 350F and line a sheet pan with parchment paper. Once the dough is nice and fluffy, brush the loaf with the topping mixture of egg yolk and milk. Sprinkle the sliced almonds on top. You can also sprinkle coarse sugar over the Rosinenbrot if you like. Bake the loaf for 20 to 30 minutes until it is nice and golden brown. Let the Rosinenbrot cool on a wire rack before slicing. While obviously best served fresh the same day, for most people this is not realistic for breakfast unless you get up at five in the morning to bake. Once cooled store the Rosinenbrot in a brown paper bag or bread box if you have it and serve as soon as possible. If all else fails, use plastic wrap to avoid it from drying out. A deliciously soft and fluffy Raisin Bread (Rosinenbrot) from Luisa Weiss’ “Classic German Baking”. 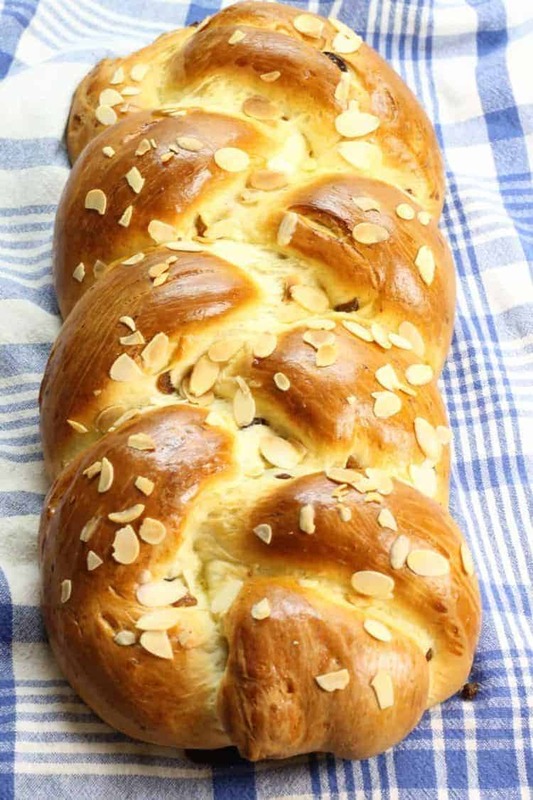 The perfect loaf of bread to serve for breakfast on Easter or other special occasions. Start by warming the milk in a pot on the stove until luke warm. Add in the active dry yeast and let it sit for 5 minutes to activate. In a large stainless steel bowl mix together the flour, sugar, and salt. If using instant yeast simply mix it into the flour and skip the above step. Pour the warm milk/yeast mix into the flour well. Add the butter and egg to the liquid mixture and using a wooden spoon stir in the flour from all sides until you have created a ball of dough. 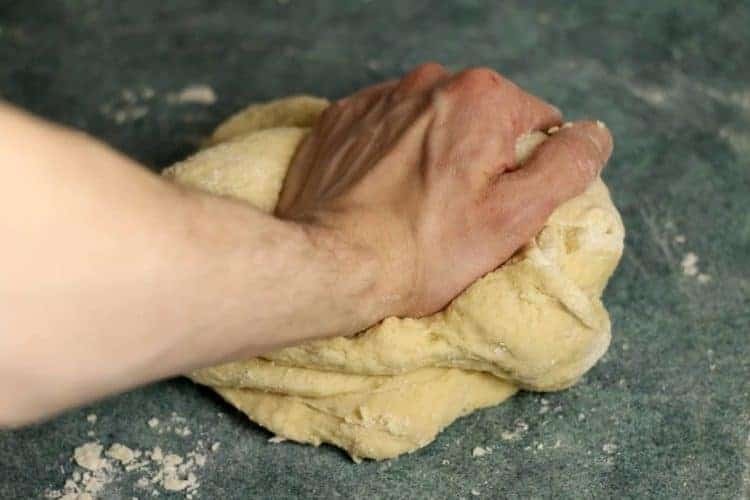 Sprinkle a little flour on the counter, and knead the ball of dough for at least 15 minutes until it is super smooth, and supple. 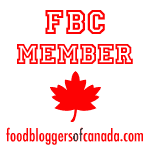 Form a round ball and place it back in the mixing bowl. Cover with a clean dishcloth and let it rise in a warm area of your kitchen for 1 hour or until double in size. Remove the dough from the bowl, flatten the dough on the counter and sprinkle the raisins on top. 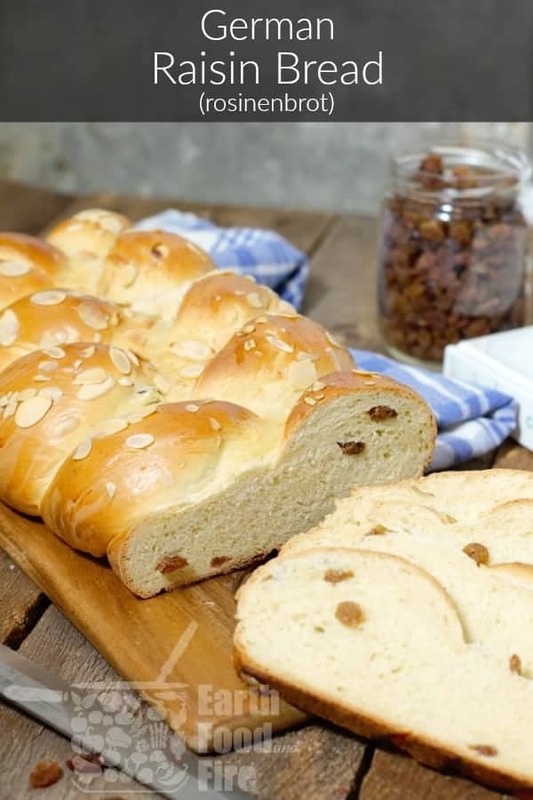 Fold over the dough and knead in the raisins. Cut the dough into 3 equal pieces and roll each piece into rolls 16 inches long. Braid the three strands of dough into one big braid. Tuck the ends of the loaf under to hide any loose sections. Transfer the braided dough to the parchment lined sheet pan, cover and let the loaf rise for another 20 minutes. Pre-heat your oven to 350F and line a sheet pan with parchment paper. Once the loaf has doubled in size, brush it with the topping mixture of egg yolk and milk. Sprinkle the sliced almonds on top. Bake the loaf for 20 to 30 minutes until it is nice and golden brown. Let the Rosinenbrot cool on a wire rack before slicing. Hi Erika, yes instead of kneading the dough by hand you can mix and knead the dough in a stand mixer with a dough hook such as a kitchen aid mixer. Really the preheat information should be listed after the last rising. There’s no point in having the oven heating up for over an hour. This came out good, it’s just an odd way to write up a recipe. Hi Monica, That is a very good point, I will make the adjustment to make the recipe more user friendly! My dough wasn’t wet enough, I guess? I’ve never been good at making bread. I used instant yeast. When I was kneading it, within minutes it just seemed too dry. Do you have a YouTube video on doing this? Hi Brittney, Im sorry to here you are having trouble with the recipe. I don’t currently have a video for it, but I will work on one and let you know when its up. If you have a picture you can tag me on social media (@earthfoodandfire) or message me on facebook (facebook.com/earthfoodandfire) and I can help you trouble shoot. When using instant yeast you simply add it into the flour before adding the liquid. Then you would add the milk, egg, and butter.You would continue to mix the dough and then knead and let the dough rise as normal. Thanks for your sharing. I’m going to make this bread. Can this be froze to use later? Hi Shanee, it can be frozen through it may not be quite as soft after freezing/thawing. I would suggest wrapping it really well in seran wrap and then in a ziploc bag to freeze( to keep it from freezer burning and drying out) and then when you go to thaw it let it thaw completely in the wrap so it retains all original moisture. Hope this helps! Oh I cant wait to attempt this recipe today! It’s so good! Hope you enjoy it! I make a very similar bread only without the egg… I will have to give yours a try! Love all the step-by-step photos here. I’d love to see pictures of the bread you make! I hope the pictures make the instructions clear! I highly recommend Classic German Baking though, a great book food with many delicious recipes!